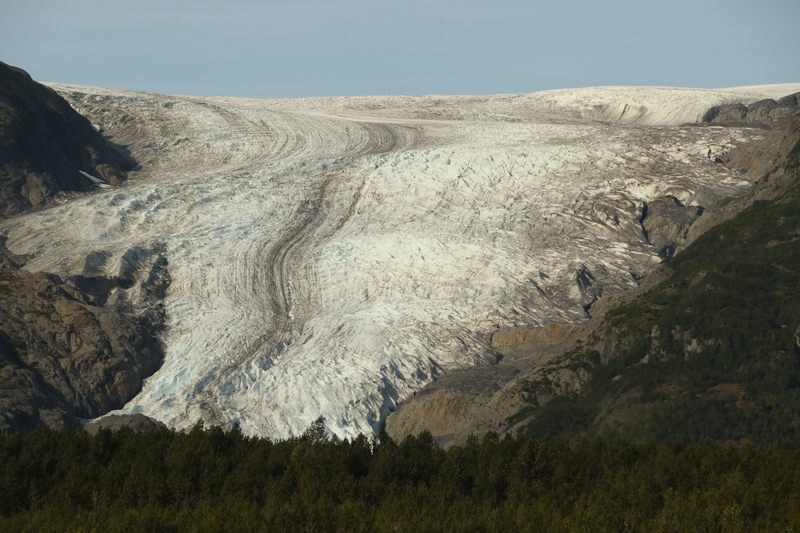 There’s still an Exit Glacier outside of Seward, but judging by its rate of retreat, there won’t be one for a whole lot longer. 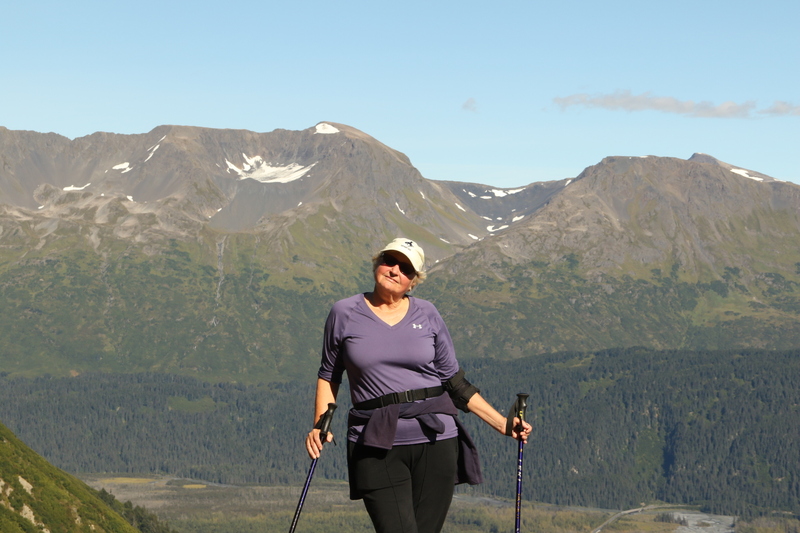 Due to our experience at O’Leary Peak in Anchorage, we were leery of any hike in Alaska that calls itself strenuous, and the hike to view the Harding Icefield above Exit Glacier was described as extremely strenuous. The Park Rangers reinforced the impression, so we were convinced to hike to one of the two shorter destinations on the trail, either the first overlook, Marmot Meadows, or the second, more scenic view at the Cliff. 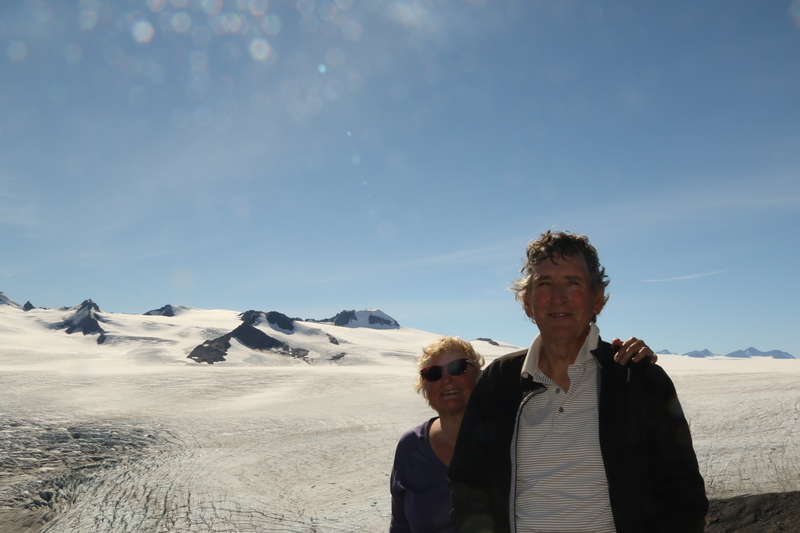 We hiked the mile to the lower view of the glacier as a leg stretcher. 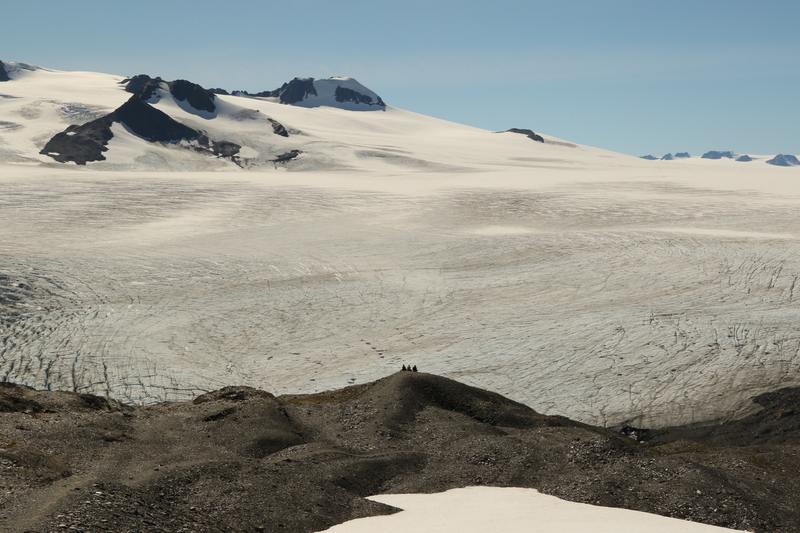 It’s a really impressive view of a glacier at close hand, but fifty years ago we would have been touching the glacier at the overlook point. 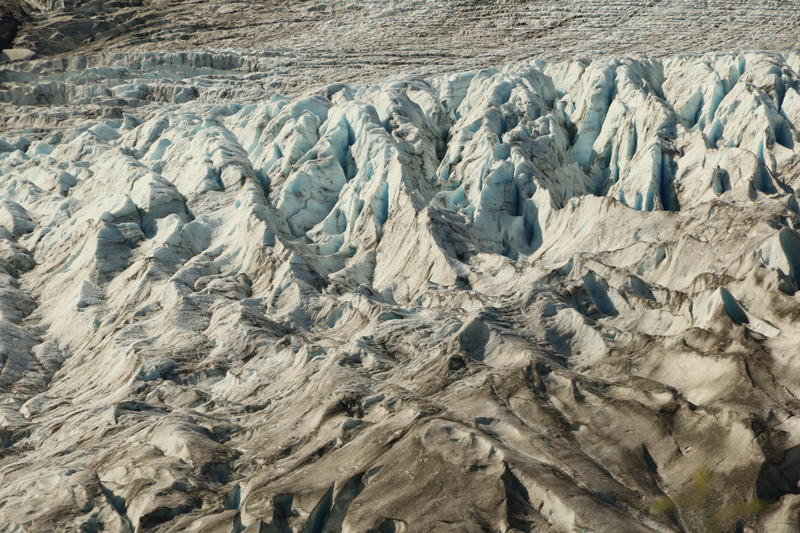 Then we set off to climb to a better view of the glacier. 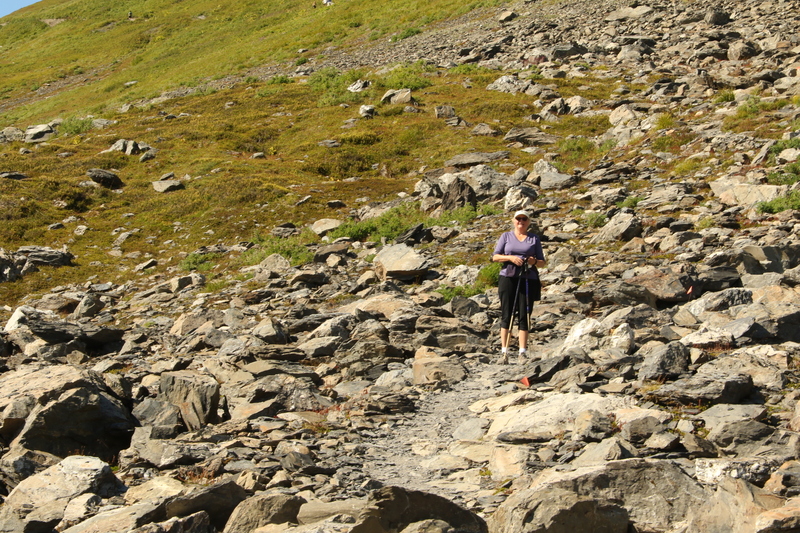 The view at Marmot Meadows was okay, but we were fresh, and the trail was not as sheer as we’d feared. 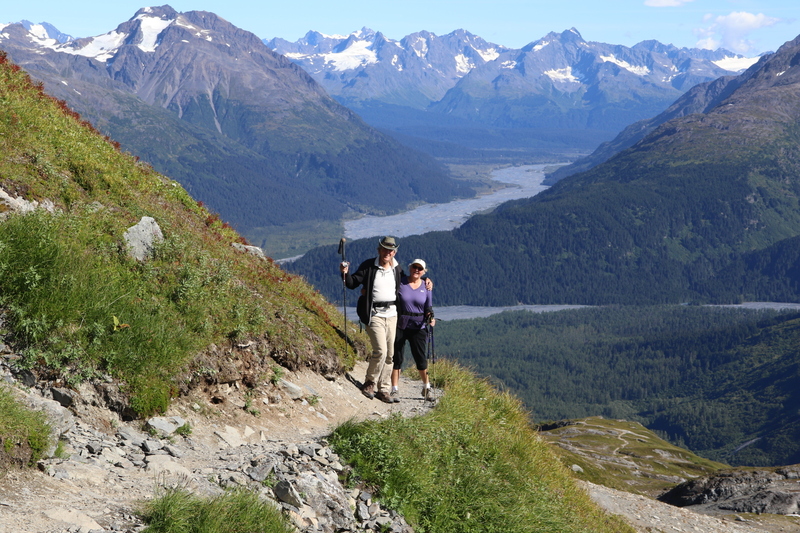 In fact it had a trail feature novel to Alaskan mountain trails: switchbacks. And steps had been cut into the rocks to help with the steeper sections. The view at the cliffs was exceptional, and we could see dozens of hikers coming down the trail from the end. Nowhere did the trail go straight up. Unfortunately, we had not packed sufficient water to carry us four-and-a-half miles (each way) and 3500 feet up. So we rested up. And then, miraculously, we went up instead of down. The views from the trail above the Cliff were spectacular. 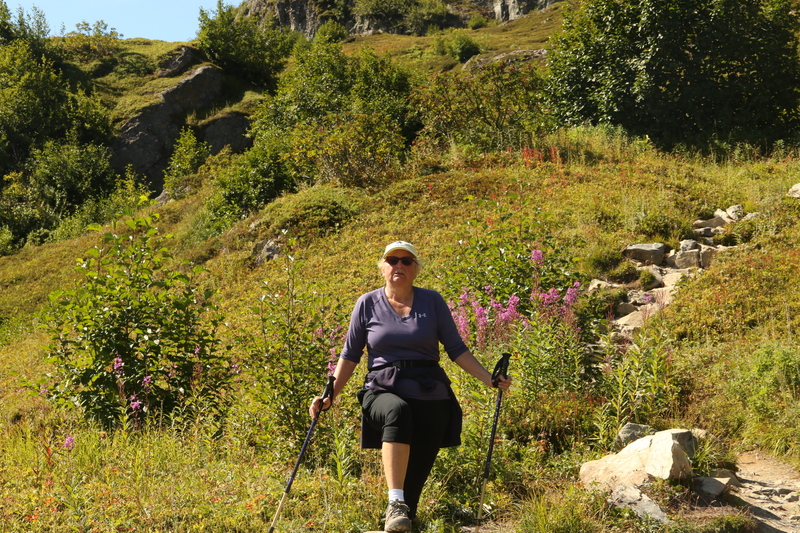 It turned out the trail was longer, and somewhat steeper, than it had appeared, but we pressed on. 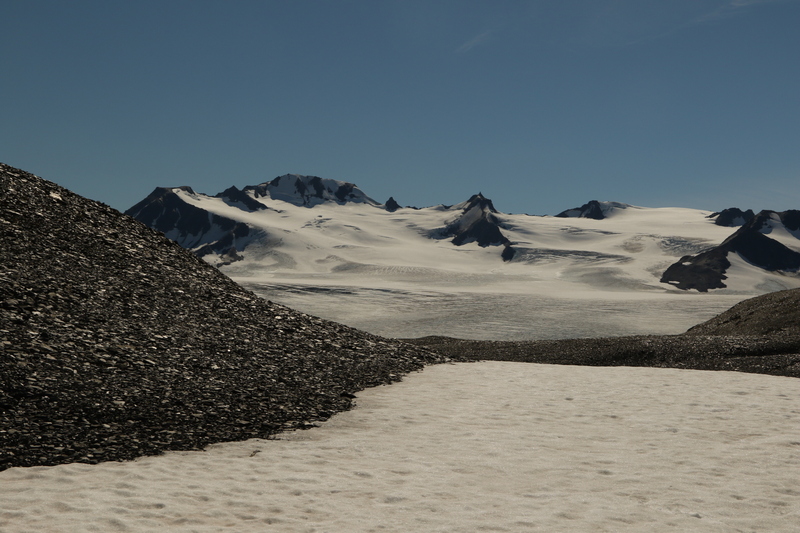 Finally, after three and a half hours, we reached the upper terminus of the trail, where we could see hundreds of acres of ice stretching to the far peaks. We were quite proud of ourselves when we reached the ground. Deservedly so, I think.